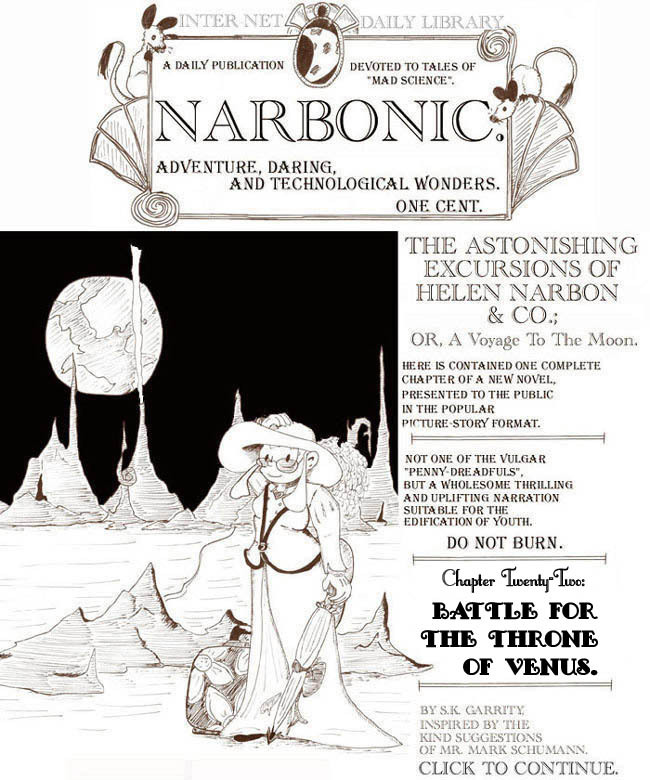 The Astonishing Excursions of Helen Narbon &Co., Chapter Twenty-Two. Yes! Another Victorian installment! I remember writing this very quickly at the last minute, but I really like the way it turned out. 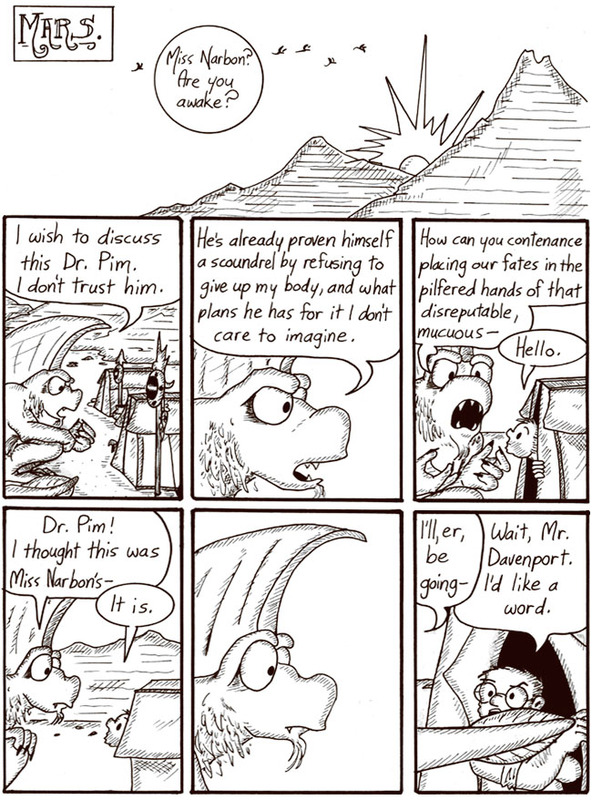 Hapax Legomenon Dave’s relative size still tends to change dramatically from panel to panel. Drawing is hard. The tent looks like Snoopy’s doghouse, not that there’s anything wrong with that. Just saying. 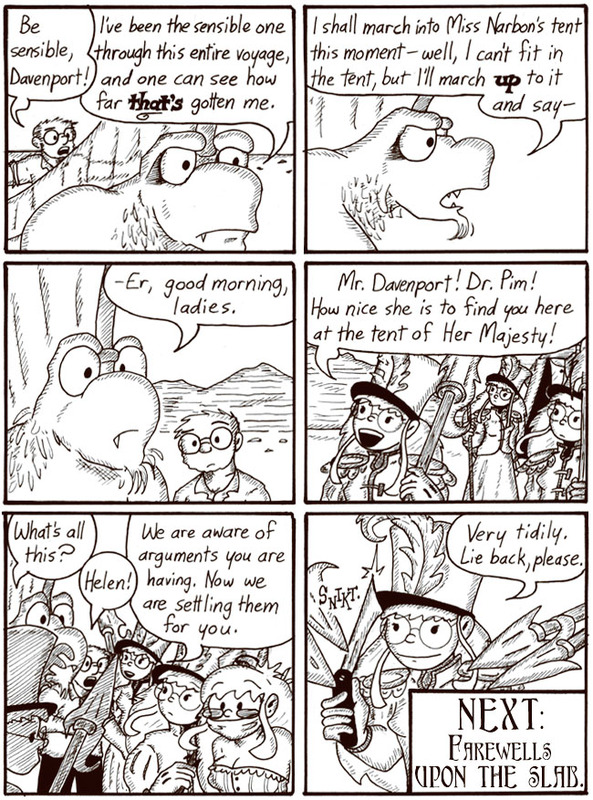 This might be my favorite page out of the whole Victorian saga. In general, the Victorian story has more overtly romantic material than regular-flavor Narbonic, but it’s a romantic adventure, after all. One thing Dave never gets the opportunity to be, in any sense of the word, is Helen Narbon. Helen is, in spite of being the title character, unreachable and unknowable. Her secrets and talents are the weights in the plot’s equilibrium, and for Dave to become her, even on a purely symbolic or facile level, is to break that fundamental imbalance. But would he want to be Helen Narbon, if it were possible? Interestingly, although he holds her in awe as a love interest, he doesn’t seem to hold her genius in awe in particular. He generally regards her science as just earthly talents and skills outside his discipline. He would probably not find himself personally inadequate or unworthy of taking on Helen’s life, as if a man taking on the mantle of a god. But, sadly, based on a false premise.